Remember to keep your essential items in an easily accessible box during a move. 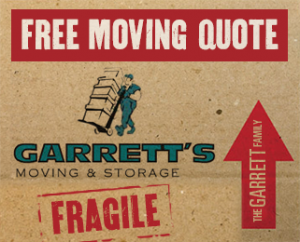 Check out our blog for weekly moving tips and advice from the leading Dallas movers, Garrett’s Moving and Storage! If you are moving there are a lot of benefits in having a moving sale, the biggest being that you get to make some money off any items you aren’t taking with you. Extra couches, chairs, dining furniture, beds, desks, the list goes on and on, if you won’t be using it in your new home, put it up for sale. Another benefit of the moving sale is that you can take up less space in your moving truck. Some companies charge based on how much space your items take up in the truck, for instance, if they are allowing other consumers to rent space, too. Storage companies at the new place, or where you already are, charge by how much space you need. When you have fewer belongings, especially furniture, you can rent a smaller room. In the new area, you might only have to rent storage space for a few months, but if you need space where you are for some reason, you will probably have it for several months at the least. As humans we tend to collect, keep, and attach feelings to items. Usually this kind of behavior is perfectly fine but, for a lot of people, moving is the perfect opportunity to get rid of the ‘extra’ stuff you don’t need. There is no definite way to maximize your pricing, while also getting buyers who still want the deal. There are however, a few things you can do, to figure out how to price your belongings. Moving is stressful, and having a moving sale can be fun or daunting. If you need the money, truck space, or less clutter, consider putting on a sale. If it is going to be too much hassle, put as much as you can in storage, or give things away, there are always people looking for free furniture, clothes, etc. Garrett’s Moving and Storage are Dallas movers with over 20 years of experience of moving in Dallas and across the country. We are BBB accredited so you can have peace of mind knowing your belongings will be in good hands. We also have a best-in-the-industry extended coverage policy. Contact us today at 972-487-5843 for a free estimate or click here to request a quote online from the leading Dallas movers.